Even as activities continue in public offices, the labor congress officials are still trying hard to convince minds of the need for the strike. For instance in Abuja this morning, the National Labor Congress Gen sec Gen was at NTA area 11 gates to see that this message was passed. Amid tight security, labour leaders, who marched from the federal secretariat, did not force people to comply with the strike order. 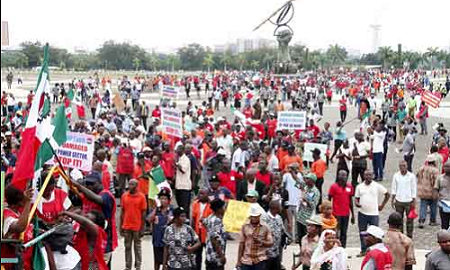 No forceful activity have been heard of Normal activities continued in Abuja, Bauchi, Yobe, Kano, Adamawa, Jigawa states and Bayelsa States on Wednesday as residents ignored the call by the Nigeria Labour Congress (NLC) to embark on strike over the increase in pump price of fuel. But the strike largely succeeded in Gombe and Plateau States where schools, banks and government offices were closed. The NLC restricted the strike to the state secretariat along Independence Way in Kaduna because of the peculiar problems of security, as well as Katsina, Kano, Bauchi. Normal activities were also ongoing on in Damaturu, the Yobe state capital as well as in Adamawa State as they were not convinced that the strike was the best alternative in the present circumstance. In Sokoto, some civil servants said they would not join the strike because it would only aggravate current hardships in the country. One of the workers, Hajiya Lami Bello said that the NLC should respect the decision of the National Industrial Court, which ordered the union not to proceed with the strike. Another worker, Karim Ahmed said most civil servants were conscious not to fall into the trap of `no work, no pay’ as announced by the government. The Chairman of the state NLC, Murtal Usman, told NAN in a telephone interview that he was on his way to Birnin Kebbi from Abuja, and insisted that the strike would hold. The State Secretary of Birnin Kebbi Federal Medical Centre of National Association of Nurses and Midwives, Usman Mohammed, said they had not received any signal to embark on the strike. In Kano, the nationwide strike action called by the organized labour has also met a setback, as workers in the state ignored the directive. In Katsina, NAN reports that the workers at the State and Federal Secretariats have reported to their duty posts. Kogi disregard NASS, AGF tells IG as offices are still open. 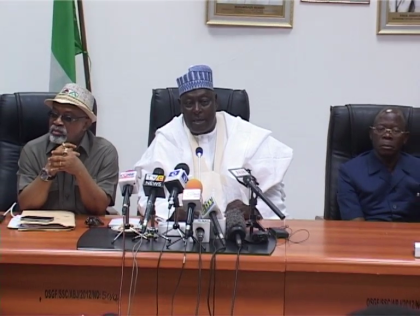 Statement by Engineer Babachir David Lawal, Secretary to the Government of the Federation: The attention of all Public Officers is drawn to the notice issued by the Nigeria Labour Congress (NLC) to embark on an indefinite strike from Wednesday, 18th May, 2016. This notice is regrettably given in spite of an Order by the Industrial Court against the strike action. Government, therefore, calls upon and advises all workers to respect the laws of the land and to desist from participating in an illegal strike action. Government undertakes to guarantee the safety of workers and their work places, and expects that normal work will continue in the interest of the nation. Accordingly, Security agencies have been directed to ensure unimpeded access to offices, work places and markets. Acts of intimidation, harassment, including barricading of gates, locking up of offices, blocking of roads and preventing workers from carrying out their lawful duties will be met with appropriate response by the law enforcement agencies. Accordingly, all Ministers, Permanent Secretaries and Heads of Government Agencies are hereby directed to invoke the provision of “no work no pay” in respect of any staff who absents him or herself from work to join the strike action. Attendance registers are required to be opened in all Ministries, Departments and Agencies. I guess AMT TANIMU did not edit/proof read this article before publishing it, his numbering started from 2. Maybe you guyz have invented another numbering system. smh. we need change!! !